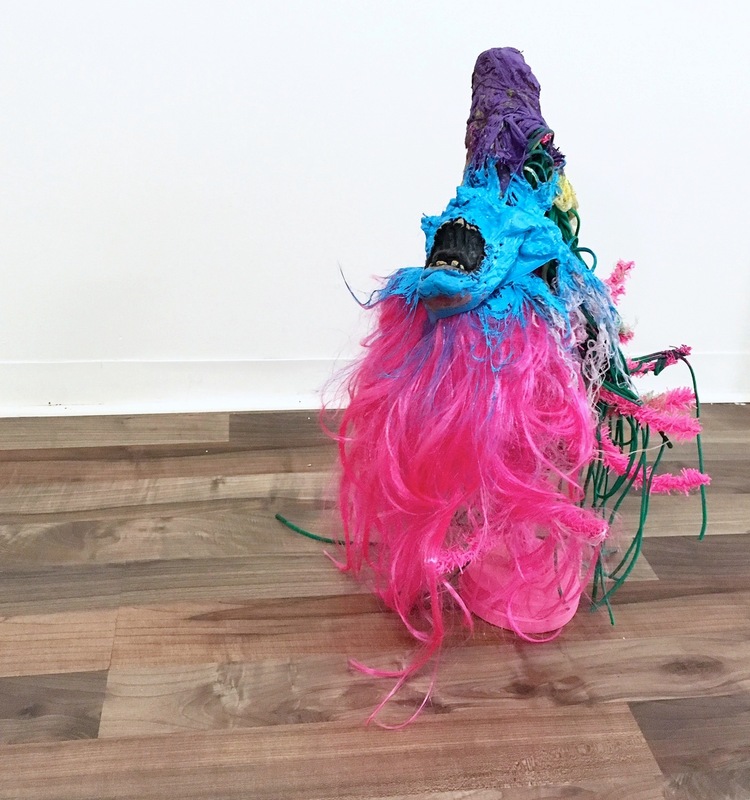 Now in its fourth year, the BRICworkspace Visual Artist Residency program gives visual artists the space, resources, and support to take their work further and explore new directions. 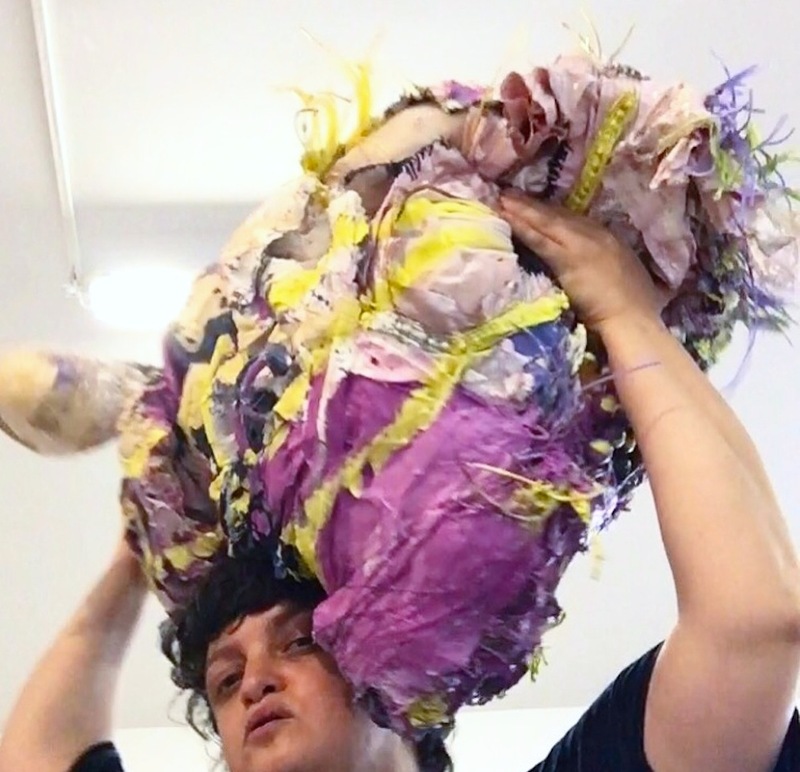 Katya Grokhovsky, a Ukraine-born, Brooklyn-based, multidisciplinary artist who explores themes of migration, female experience, and matriarchal lineage, is currently one of those artists-in-residence. 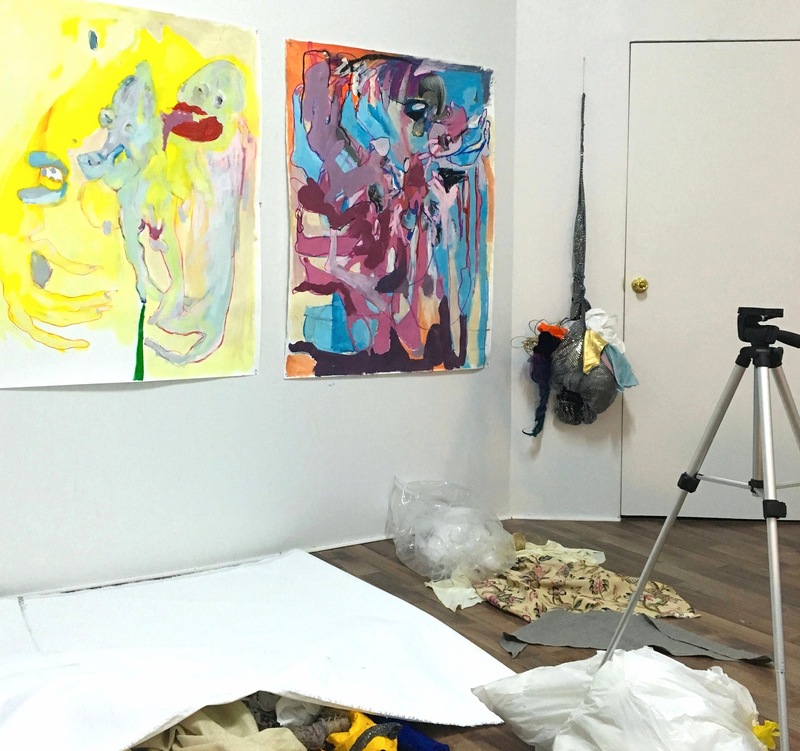 Hallie Ayres, who is currently assisting BRIC’s Contemporary Art program, recently visited Katya at her residency studio to learn more about her current projects. What have you been working on so far as a BRIC Artist in Residence? This residency is coming at an extremely important point in time for me, as I am in the process of consolidating and re-calibrating my whole practice, after making work and exhibiting intensively for 6 years post grad school. I am utilizing the residency as an incubator, a making lab, hatching new ideas, looking at everything I have done so far, thinking about my subject matter, my themes, my materials and recycling some previous, earlier works. Currently I am working on videos, sculptures, drawings and paintings for upcoming large-scale solo projects. It looks like you’re also dismantling some old works and reusing the materials? Yes, most of the sculptures I’m working on now have some parts of older works in them. I work in many different media, and sometimes I re-use my own work in order to create new series. For example, I have a sculpture here that contains several materials, including a headpiece I wore a couple of years ago for a performance. Sometimes, post-performance, I would re-assemble the props and costumes I used into new sculptures and installations, months or years later. Does the idea for the sculpture come out of whatever the performance was? It’s often not related directly anymore, but all my work is connected to themes of body, memory and female experience. This is a beginning of my thinking process for a solo project, that’s going to have a selection of my various works, including video performances larger-scale installations and sculptures. So I am currently bringing some past works out of storage and slowly reworking, deconstructing and constructing them at BRIC, where I have access to a physical space and time to do that. When you’re consolidating sculptures are you trying to make it so that the original forms can still kind of be seen? Or are you concealing them and turning them into something entirely new? It would be hard to see the original forms. In a way, it’s similar to working with raw material, except I am more interested in found objects, what’s already available in the world and what I am able to find and select. So right now I’m doing an archival dig of my own found sculpture. A lot of the materials I am working with comprise my New York history, what I have accumulated and keep collecting daily. I think through doing and making, so I often pile materials and objects together, often changing the work many times, before I begin securing it into placement. I love unconventional materials; it’s kind of like a challenge on Project Runway. I have to make it work. Do you have a particular end-goal that you’re working towards with all of this consolidation? There are two solo projects that I’m working on here [in the residency], and that’s what the consolidation is for. One of the projects I am working towards is a solo exhibition, which will take place in 2018, and will deal with themes of gender stereotypes and subversion of patriarchal regime through various media, and the other is a video installation project about my grandmother. I feel like the latter project, which deals with my family history, migration and survival is informing my whole practice at the moment, as I am watching and listening to hours of footage of my grandmother telling her story, which I filmed on my recent visit to Australia, where she lives. She’s 92 and is a WWII veteran from Ukraine. When I draw, I’m thinking of matriarchal lineage, of her, of my mother, myself. Some of the objects I’m making here will serve as performance objects, as bundles— things you take with you in movement and migration—which I will employ in a culminating video at the end of the residency. Does she ever come into your work as an actual figural form? Yes, she comes in and takes on various forms, bodily and abstracted. I like to make her large-scale and think about the heroic acts, hers and that of other women, which have been systematically erased from our collective consciousness and history. I exist because she survived, so she and many others are always present. So in the video, you’re going to perform as your grandmother? I’m working on figuring out how to interpret this narrative through objects, videos and my own body. I’m not an actor, so I’m not directly reenacting the story. I am more excited by and interested in creating work which explores the stories through abstract gestures and movement, often absurd and grotesque. The tales are quite tragic sometimes, but they’re also very funny, because humor was and is a survival mechanism in my family. She and I also look alike, and I am taking some parts of her persona into consideration when I am composing the work. How do you prepare to perform in front of the camera? I construct scenarios, characters and gestures for videos as I work on 3D and 2D works, and once I know what I want to do, I select a location, arrange the objects and record. I allow my body to inhabit a world, without rehearsing. I perform acts of care, of domestic and emotional labor, which I don’t do much in my life. My apartment is a disaster. My mother once said to me, “Why don’t you put a camera in front of you and clean your apartment?” Because that’s the only way I’d actually do it, wearing a costume too. Something about the camera’s eye—knowing that it’s a potential audience and that it’s art—is a psychological trigger to clean. It’s for the world. I’m quite comfortable in front of the camera. What goes into your creative process when constructing your costumes for your performances and videos? When I’m performing, I am in a particular state, zone, as someone other, and the costume and masking help me to transform. I usually don’t speak in my work, because I find it distracting, so my body, my appearance, objects around me, the installation I am inhabiting, all act as aids of the character. It is a whole universe, and that’s my practice in general, a rotating circular spaceship, where one idea and medium feeds the next. 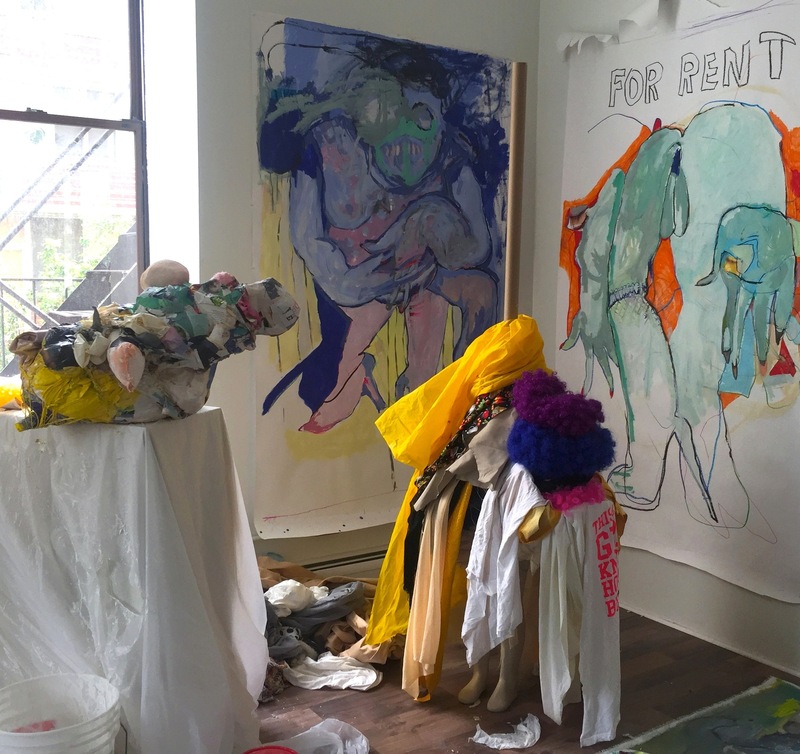 How does your curatorial practice relate to your artistic practice? I first started curating during my undergraduate degree. Following up in grad school, I arranged several group exhibitions with my peers. It was initially an opportunity to show my own work, but I realized my talent for organizing was coming through. So slowly I started taking my work out of the events, and I found I enjoy working with other artists and stepping out of my own artist’s headspace. All of my curated shows are ideas that I’m interested in as an artist, so you can see the direct relation between them and my own practice. It’s an extension of my work. Do you sense that your work changed since moving to Brooklyn? I do, specifically in terms of scale and mobility, due to space and storage issues. When I first moved to NYC, I made a lot of performance works and small works on paper, since I didn’t have studio space and couldn’t create larger scaled physical objects and installations. That’s why when I am at a studio residency I immediately jump into making and production mode. New York can be simultaneously extremely challenging: mentally, physically, financially, artistically, and also very exciting. I love a good challenge. I don’t need comfort.